Following the Rico – Silverton Trail through South Park on our way back from The Colorado Trail. 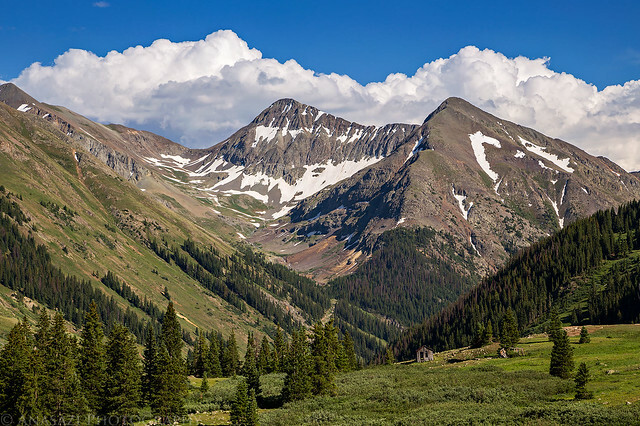 Diane and I spent the past weekend in the San Juan Mountains near Silverton getting in a little high elevation hiking. 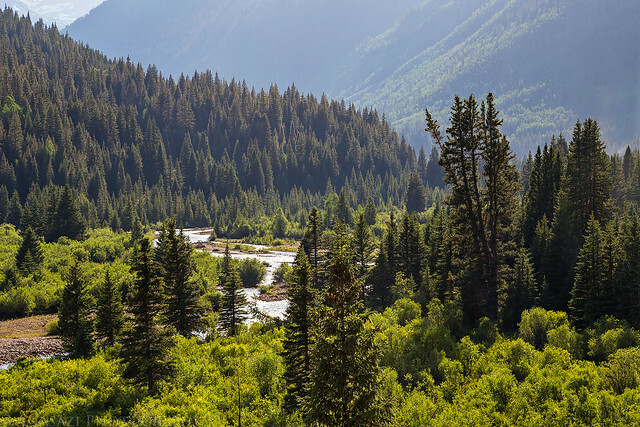 We left home early on Saturday morning and drove all the way to the end of the Bandora Mine Road in the South Fork of Mineral Creek and found a campsite shortly before arriving at the trailhead. 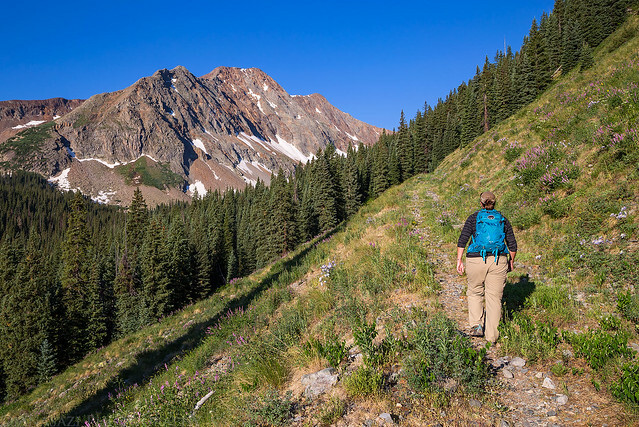 We quickly setup camp and then started hiking up the Rico – Silverton Trail to it’s intersection with The Colorado Trail. 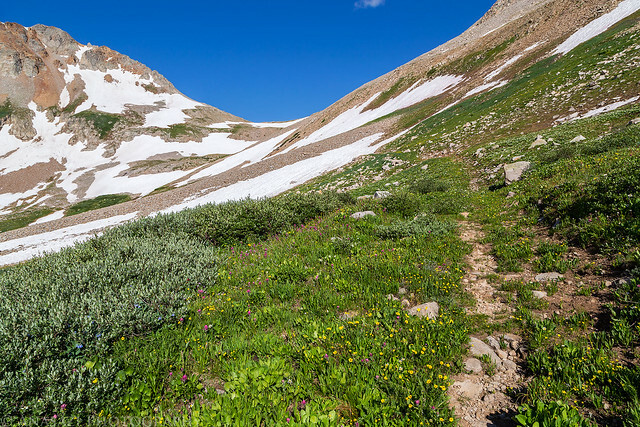 There were a lot of wildflowers along the trail, especially in South Park along with some patches of snow over parts of The Colorado Trail, including a big drift across Rolling Mountain Pass. 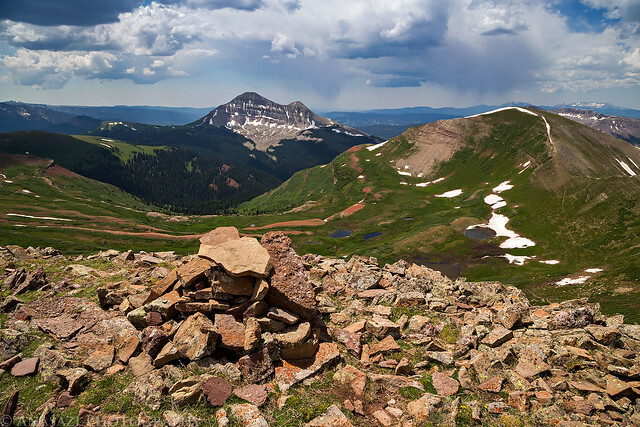 When we reached the high point of the trail I climbed to the summit of an unnamed 12er that offered great views of Engineer Mountain, Jura Knob and the surrounding area. 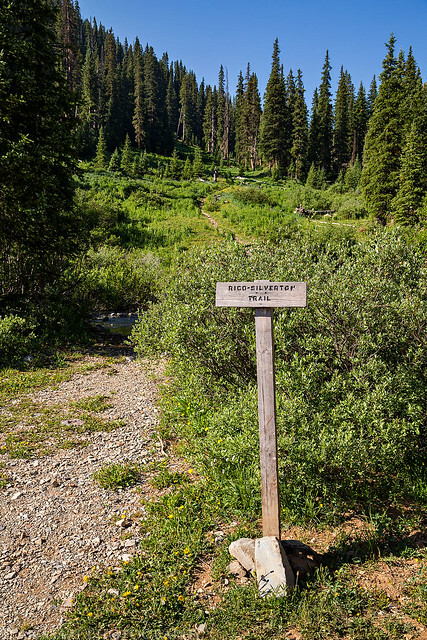 The start of the Rico – Silverton Trail at the end of the Bandora Mine Road. 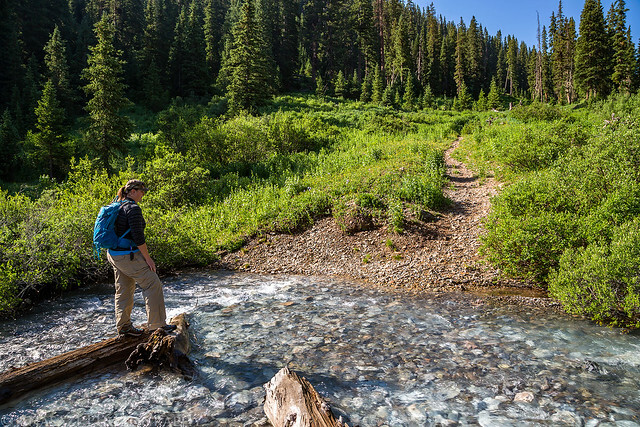 Right at the beginning of the trail you need to cross South Mineral Creek. 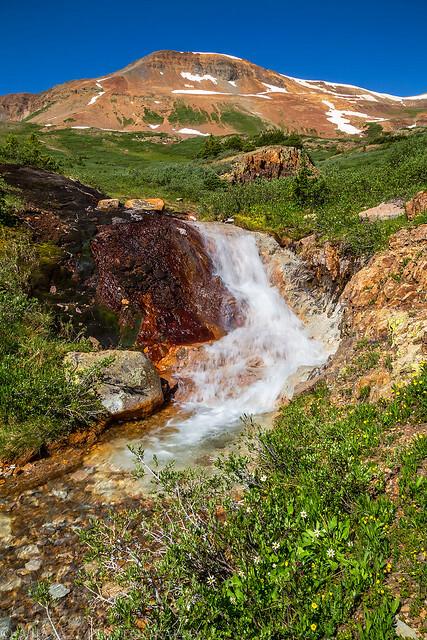 A small waterfall next to the trail. Following the trail up to Rolling Mountain Pass on the right. The high point straight ahead is PT 12766, which is the mountain I would be climbing today. 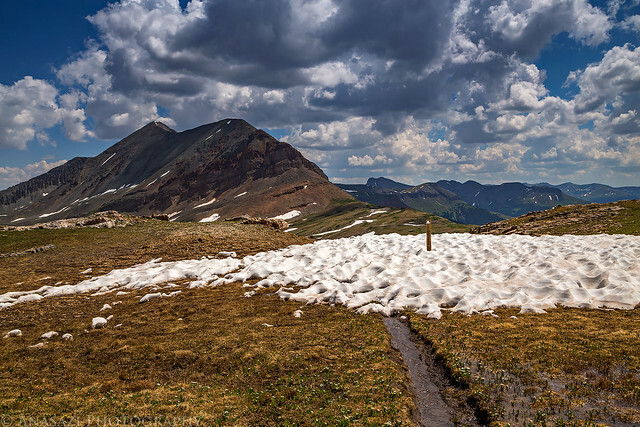 A patch of snow across The Colorado Trail. 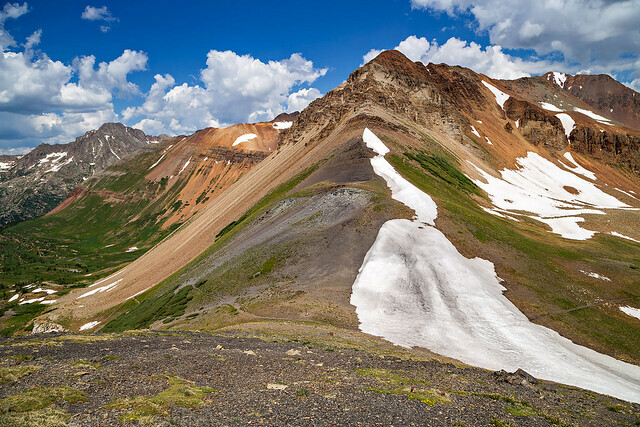 Looking back down into the South Fork of Mineral Creek with the Twin Sisters (13,432) on the right. 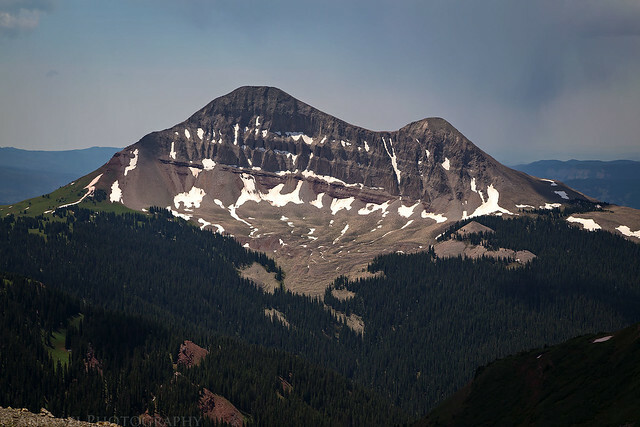 A closer look at Engineer Mountain (12,968). 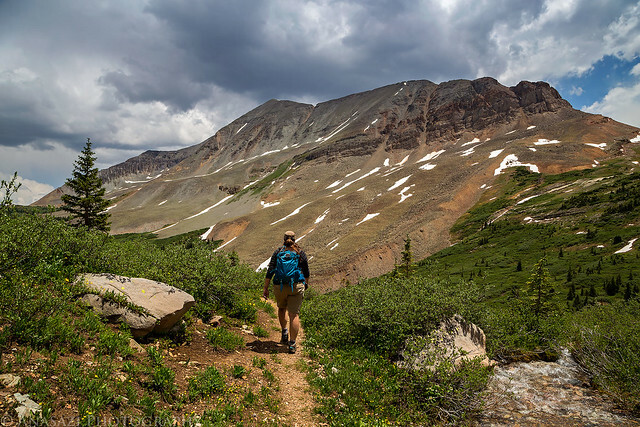 Hiking down from the summit to Rolling Mountain Pass. You can see the big snow drift across the trail. 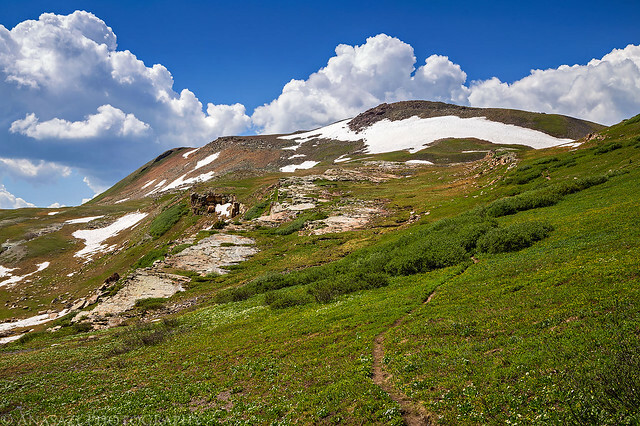 Following The Colorado Trail down from the pass. If you look closely you can see Diane waiting for me below. Hiking back down below the Twin Sisters. 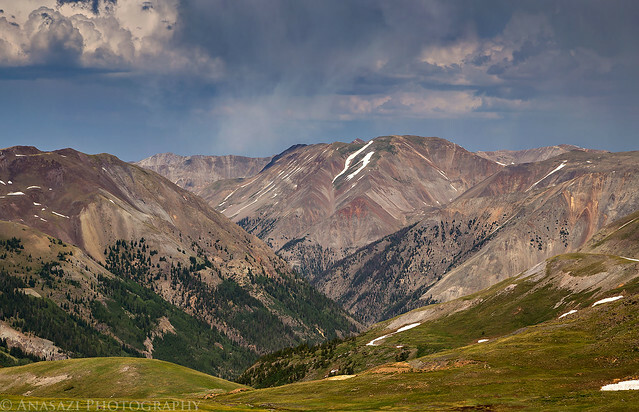 A nice view of Fuller Peak as storm clouds moved into the area. 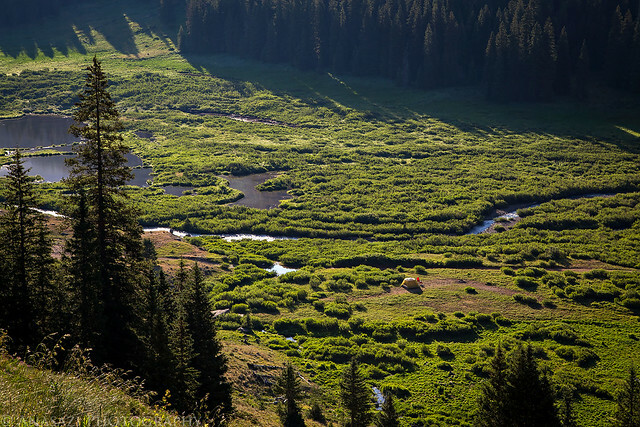 Back at camp along South Mineral Creek. 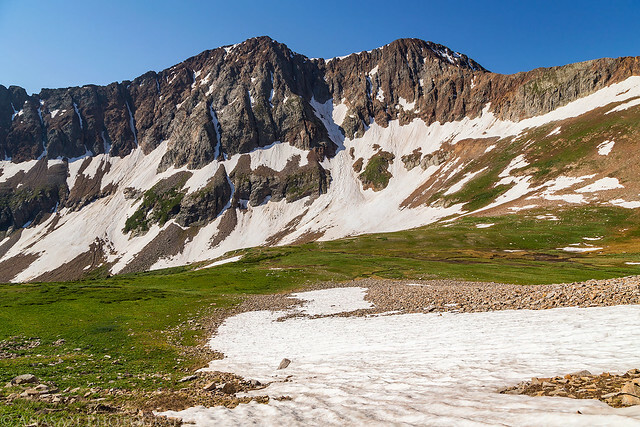 When we returned to camp we had a late lunch and then decided to go for a drive up to Engineer Pass by way of Animas Forks to see how much snow was in the area for future hike planning. 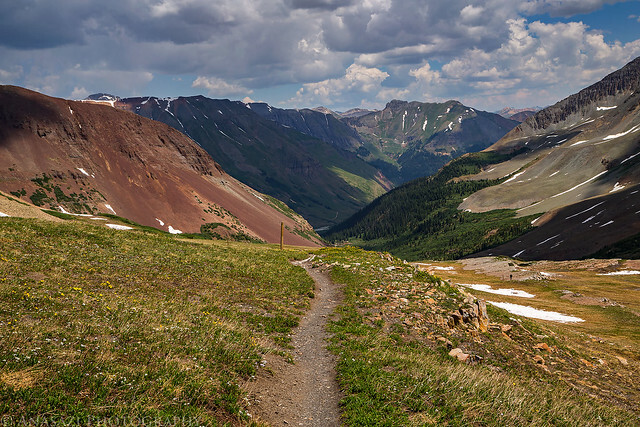 Looking down from Engineer Pass into Palmetto Gulch. 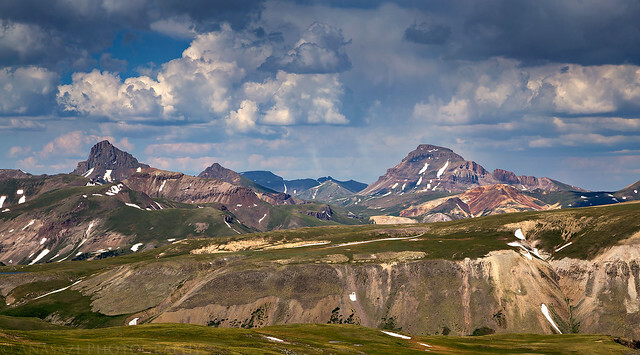 Overlooking the Uncompahgre Wilderness area to Wetterhorn Peak and Uncompahgre Peak. 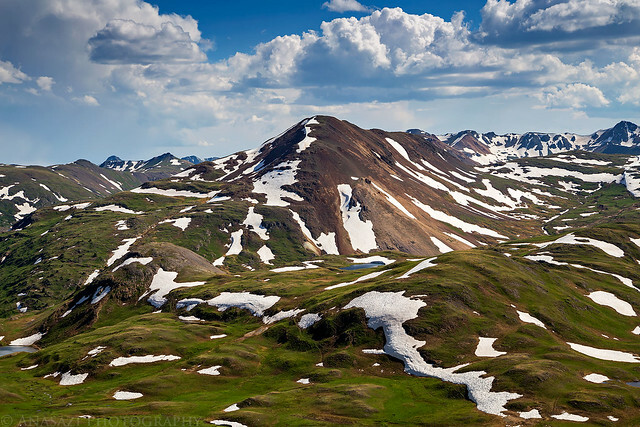 A nice view of Houghton Mountain (13,052) on our way back down from the pass. 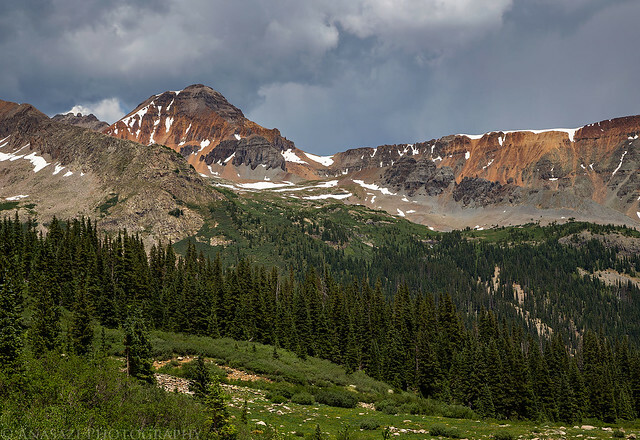 Niagara Peak (13,807) viewed from near the ghost town of Animas Forks. On our way back to camp Diane noticed a sign for Lake Hope that was nailed to a tree near an old closed mining road. 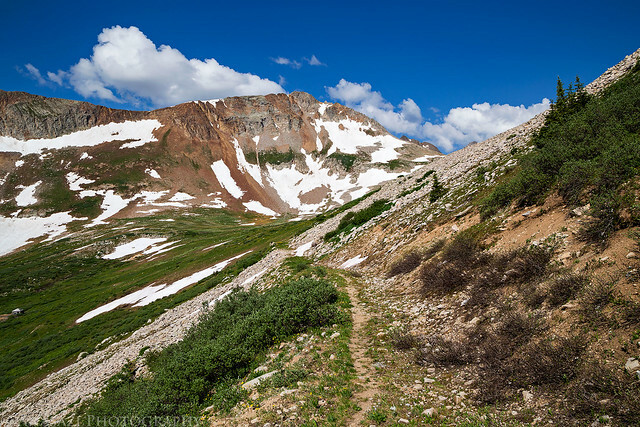 It was only a few hundred yards from camp so we looked at a map and saw that there was a trail that went up to Lake Hope Pass and then down to the lake. Since it was close to camp we decided to hike that trail on Sunday morning before heading back home. Mineral Creek in late evening light. We had a pretty nice sunset view from camp. As we were trying to get to bed early Diane noticed that my sleeping pad wasn’t in the tent or in the back of my Jeep. I double checked and realized that I must have left it at home. I’ve never done that before! Luckily, the ground we set the tent up on was pretty soft, so I put down a blanket with some extra clothes and jackets under my sleeping bag for insulation and hoped I’d be able to sleep. I was lucky that it didn’t get too cold out overnight and actually slept pretty well. After sleeping for a few hours I was awakened in the middle of the night by the sound of an animal outside the tent making a ‘snarling’ sound and walking around. I opened the door of the tent and saw a dark shadow of an animal under my Jeep that looked bigger than the average house cat. I grabbed my headlamp and shined it that direction to see a beaver looking back at me. I pressed the lock button on the remote for my Jeep to see if the horn beeping would scare it away, but it didn’t move. Then I pressed the button to remote start my Jeep and it slowly walked away in the direction of the creek. It was an unusual encounter. 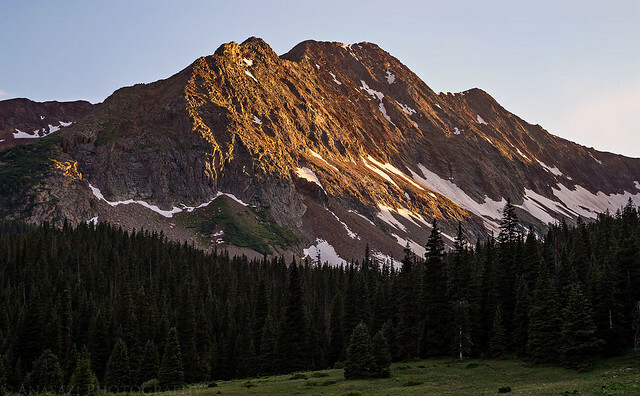 After falling back to sleep again for a few more hours, we woke up with the sunrise on Sunday morning and drove the short distance to the trailhead for Lake Hope Pass. 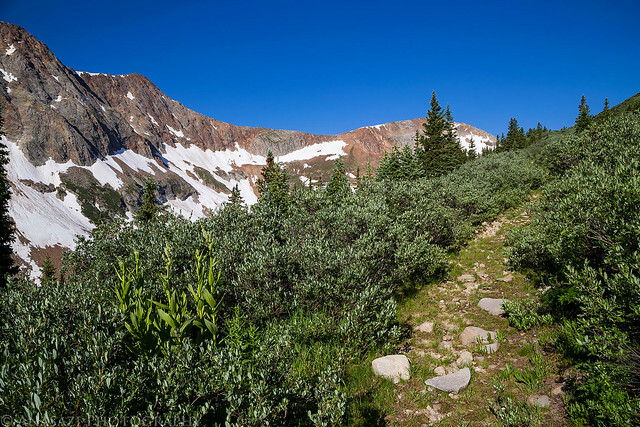 After hiking through the forest for a little bit the trail eventually opened up into a nice basin above treeline. 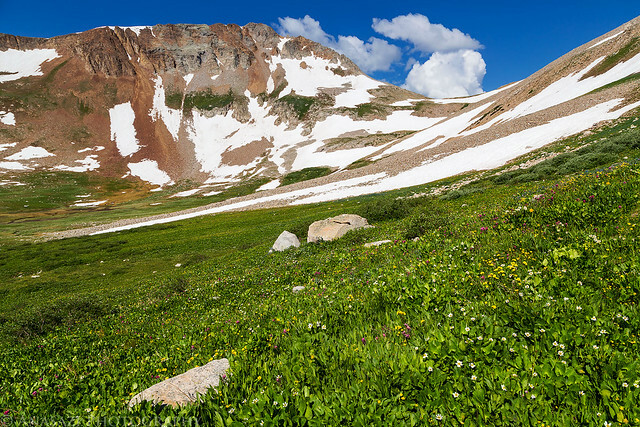 There were also plenty of wildflowers up here. 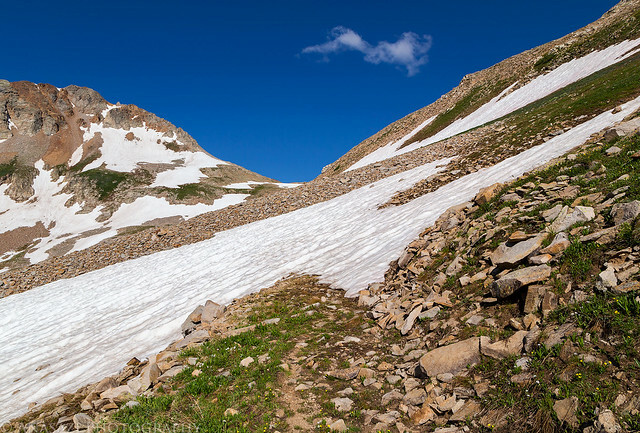 Unfortunately, about half a mile from the pass the trail was blocked by some pretty big snow drifts. I managed to get around the first one but only encountered more that were even bigger after that. Since I didn’t see an easy way around them and we didn’t have traction devices with us we decided to call it a day and turned around to head back down. We will have to save visiting the pass for another day, probably from the other side next time. 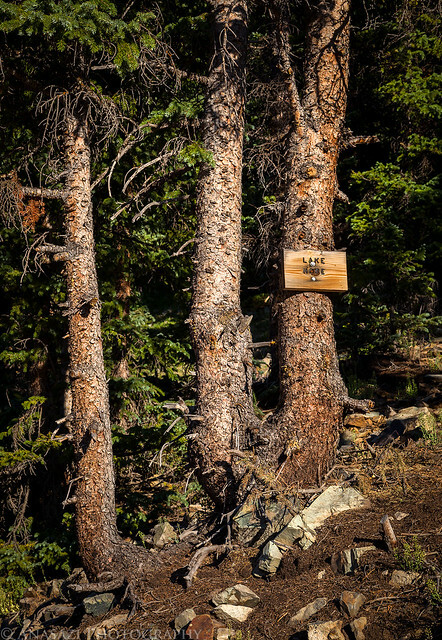 The is the small sign Diane spotted the evening before near the trailhead. 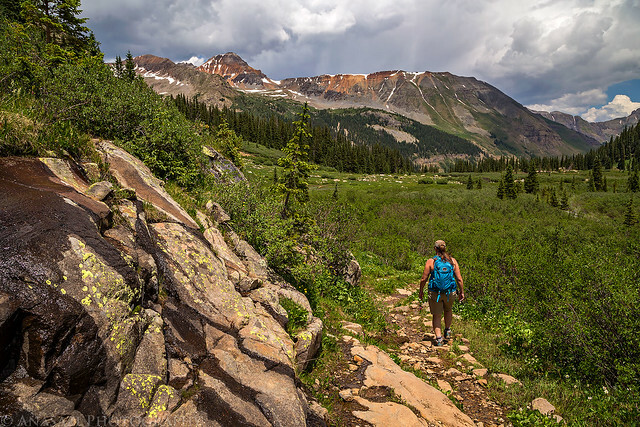 Hiking up the old mining road to Hope Lake Pass. You can see our tent below from the trail. Hiking through the thick brush on the old road. 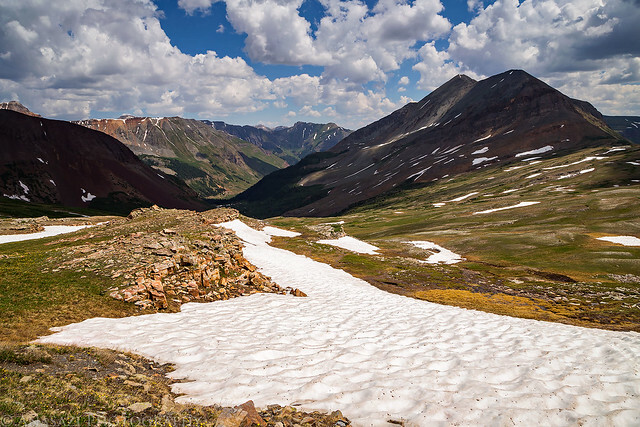 Lake Hope Pass is the low point straight ahead. 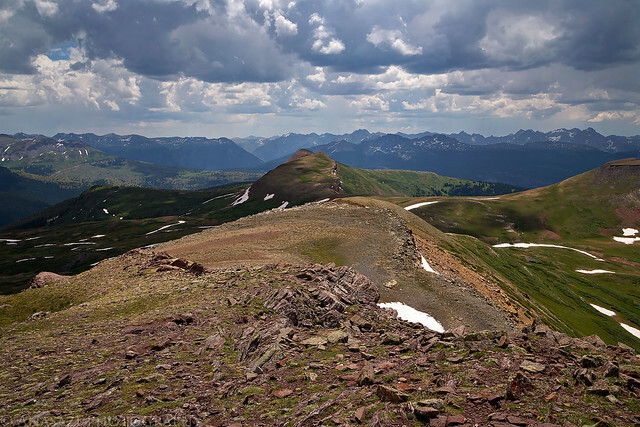 View across the basin to Rolling Mountain (13,693). 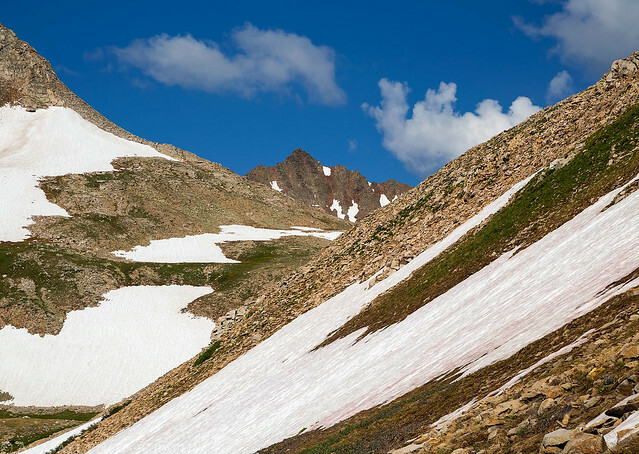 As I climbed above the first snow drift we came across, I did get a nice view of San Miguel Peak (13,752) through the pass. 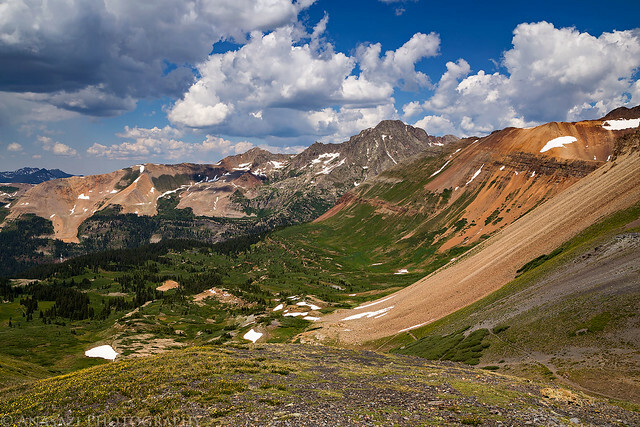 A view of the upper basin as we turned around and hiked back down. 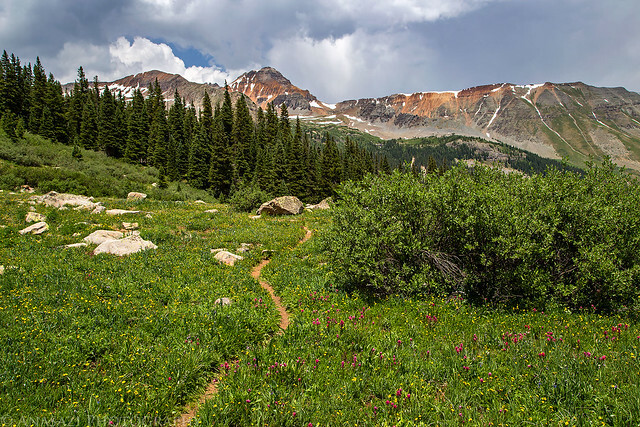 One last look up the trail in the upper basin as clouds started to build for the day. When we returned to the trailhead we drove back to camp and packed up our tent to start the drive back home. After traveling a mile or two I started to smell coolant, so I pulled over to check things out. At first I was wondering if the beaver I had seen the night before had chewed on something under my Jeep, but after opening the hood I could see that the coolant was shooting out of the back of the radiator, and it was a pretty big leak! 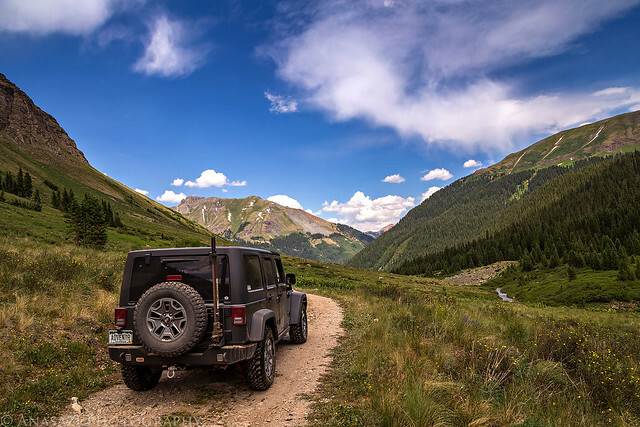 I decided to quickly drive the Jeep into Silverton where we would have cell phone signal and made sure to closely watch the temperature gauge on the way there. We arrived in town without any further issues (aside from losing more coolant) and parked on the road behind the Conoco station. 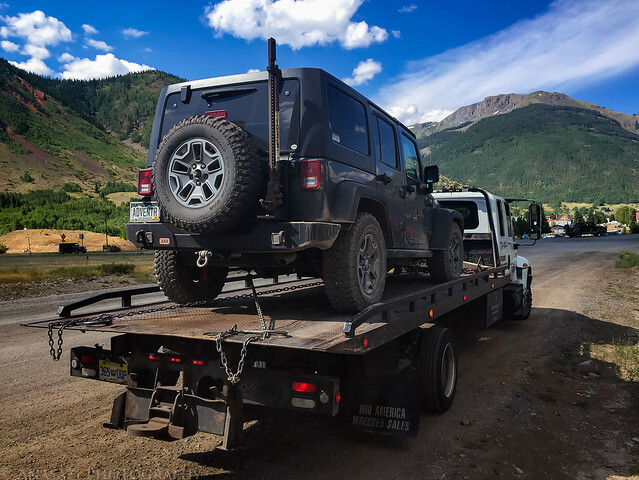 Thankfully, I signed up for AAA after having my last Jeep towed to Moab a couple years back, so I was able to get my Jeep towed back to Grand Junction relatively inexpensively. It just took a few hours of waiting for the tow truck to arrive and then the slow drive back to Grand Junction in a truck that did not have working air conditioning. It wasn’t the best way to end the weekend, but at least we got some nice hikes in. Oh yeah, the dealer covered the new radiator under warranty even though my Jeep was slightly over 36,000 miles, so that was pretty nice, too. Below is a map and GPS track of both of our hikes from the weekend so you can check them out for yourself. Randy, what happened to your jeep was probably done by marmots. I ran into the same problem while hiking in the Silverton area many years ago and had to replace my radiator. Marmots love the sweet taste of radiator coolant. Marmots chew on hoses and wires mostly, not the steel part of the radiator. This was definitely not caused by a marmot. The radiator sprung a leak behind where the fan is located, so there is no way any animal got between there and chewed on it. Just a defective radiator this time…a known issue with some Jeeps, as I have found out. That’s not to mention that my Jeep was low on coolant a few weeks ago and the dealer couldn’t figure out why. Now we know why! Didn’t really see any wildlife the day we were there, that I can recall. We saw a few people with mountain bikes on the trail. 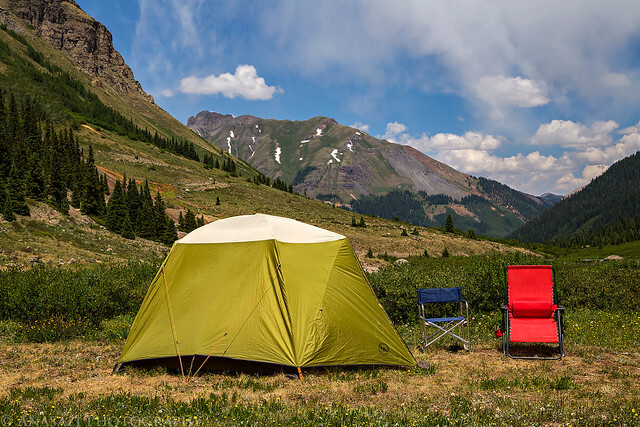 Yes, there is plenty of camping near the trailhead. Sorry for sending you last email.